Even if you accidentally format your hard drive, you can still recover your lost data. The most convenient method is to use format data recovery software to help you retrieve data back. Accidentally formatted hard drive and data lost. Is there any way of recovering formatted hard drive and getting data back? In today’s technologically advanced world, we rely on our gadgets more than people sometimes. All our important information, emails, work documents and pictures are safely stored in our hard drives (or so we think!) till we end up losing that precious data and hit the panic button. While it’s important always to have a backup of all your data, you can never foresee a human error like accidental formatting of your hard drive. But here’s the good news! Whatever the reason may be for your data loss, you can recover data from formatted hard drive using formatted disk recovery software. With the increase in digitization of data, literally all of our memories, our important emails and all the personal information are stored in our hard drive. While the reasons for data loss in hard drives are mostly physical, sometimes data might be lost due to a mere human error. For example, formatting a hard drive without having a backup can result in the loss of precious data collected over the course of years. Here are some of the common reasons why a hard drive fails and needs to be formatted. Firmware Faults: Many a time, it happens that the hard disk does not get detected by the system. The system may sometimes get stuck in the middle of the booting process, making it impossible for you to access your files. Hard Disk Crash: Improper ventilation in the CPU fan can result in the crashing of the hard disk. In such a scenario, you can hear clicking noises coming from your device. Unstable Power Supply: Using unreliable power sources or too high / too low voltages to power your UPS can cause your hard drive to fail. Internal Failure: Mechanical failures can cause the files or folders on your hard disk to become corrupt and inaccessible. Or sometimes, you could face a black screen after the booting screen. Corrupted Files: A sudden shutdown of your computer or laptop due to power surges can cause some files to become corrupt and make your hard disk to fail. Using malicious programs can also spread a virus in your system leading to more corrupt files. Human Errors: As humans, we are prone to errors. Accidental formatting without taking a backup also calls for data recovery. Wrong installations of an operating system can cause the hard drive to fail, thereby requiring a format. All the above can cause your hard drive crash and thus the hard drive is often required to be formatted in an attempt to fix the issue. However, backing up important data is not a habit of every hard drive user. Hence, it is little wonder that data is gone along with formatting the hard drive. Another data loss scenario is that your hard drive is healthy, but you format it by accident. Well, data disappears too. Now, the question can be: Is it possible to recover files after formatting? The answer is of course YES. 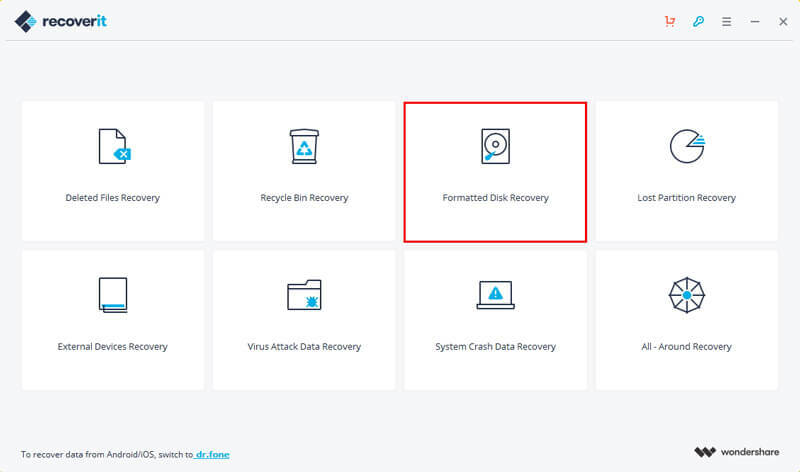 All the erased data is still stored on the hard drive as long as it is not overwritten by fresh data, so it is possible to recover a formatted hard drive with a format recovery program. 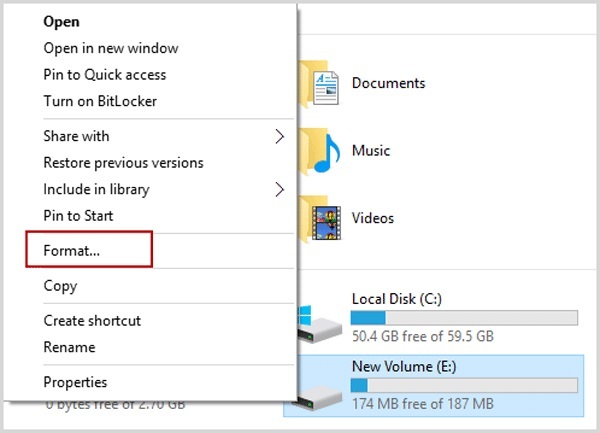 When your hard drive is accidentally or intentionally formatted, it’s best to stop using your computer after closing off all the unnecessary programs. And then get powerful format data recovery software to retrieve your data. Recoverit Data Recovery is life-saving format recovery software that can help you to recover files from a formatted hard drive in quick and easy-to-follow steps. It is compatible with all the versions of Windows including 10, 8, 7, Vista and XP. Its USP is that with its user-friendly interface, it is convenient to use even by someone who is not a computer specialist. 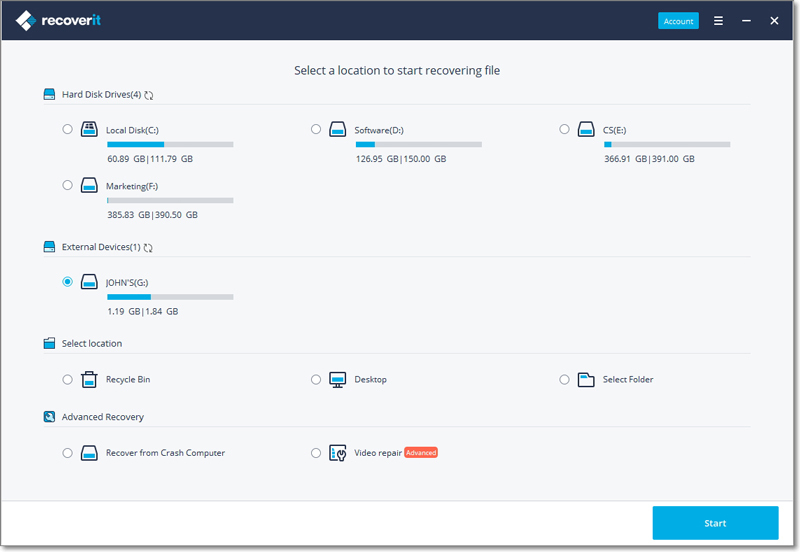 Recoverit hard drive recovery software is highly recommended if you are suffering from a data loss disaster and wish to rescue your files and get back all your data quickly. 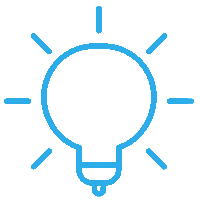 Recover lost or deleted files, photos, audio, music, emails from formatted hard drive effectively, safely and completely. 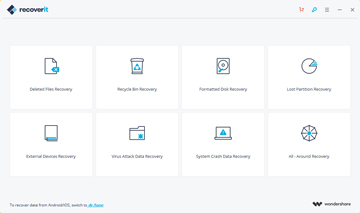 You should download and install Recoverit Data Recovery on your computer, and follow the step-by-step procedure on how you can recover data from formatted hard drive with Recoverit Windows version. If you're a Mac computer user and wonder how to recover data from formatted hard drive on Mac, please get through this guide: How to Recover Formatted Mac Hard Drive. If your formatted hard drive is an external device, you should connect it to the computer and make sure it can be detected. Step 1 Select "Formatted Disk Recovery"
Launch Recoverit data recovery software and select a data recovery mode. To recover deleted files from formatted hard drive, you need select "Formatted Disk Recovery" mode to start. Please select a specific hard drive disk where the data might have been before formatting hard drive. Click "Start" to proceed. Or connect your formatted external hard drive to the computer and select it to move on. Next, Recoverit Formatted Disk Recovery will start a quick scan. If you can't find any file after it completed, go to "All-Around Recovery" as it recovers files lost due to format more efficiently. This scan may take some time, so don’t panic. When Recoverit format data recovery is done in scanning your hard drive for lost files, it will preview some results for you. You can then choose the desired files that you want to recover, which can avoid retrieving a huge amount of unwanted data. Simply select the files that you want to recover and click "Recover" to get them back from the formatted hard drive. Note: Please remember not to save any your recovered files in the same formatted hard disk where you lost your data previously. Take a backup on another external hard drive to avoid overwriting data. If your hard drive got some error messages and need to format it. You should backup your data first and get a safe solution to format hard drive. If you want to start storing your data on a new hard drive, before anything else, you first need to format the hard drive to make it usable and manageable. Sometimes only installing anti-virus software is not good enough to get rid of all the viruses on your computer which can damage your hard drive. In such a case, it is better to format the partition infected by the virus so you can eliminate it. Once a drive is set, its file system and size are determined. Any change needed in the drives warrants for a hard drive formatting. This is the most basic failure that users experience where the drive becomes inaccessible and has to be formatted. Select the drive you wish to format, "right-click" on it and choose "format" from the drop-down list of options. Once the "format" dialogue box opens, you can choose the capacity size, though it is recommended to keep it at the default size. You can also set a file system for the drive to be formatted. Click on "Start". As you click "start" a warning window will appear before you. If you are sure you wish to format the disc, you can click on "ok" and go ahead with the formatting. a) Run "diskmgmt.msc" by clicking on the windows start icon. b) Go on "My Computer". Right-click and choose "Manage" from the drop-down menu. Then choose Disk Management under "Storage". 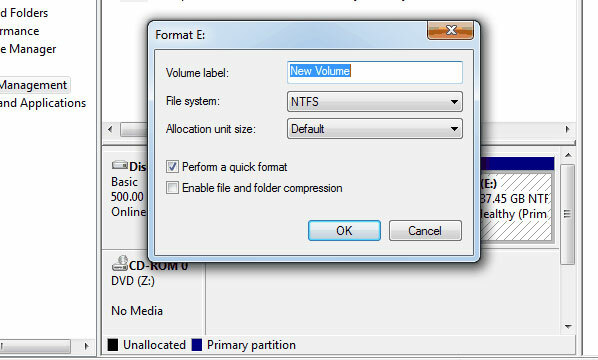 Now right-click on the target partition and select "format" from the drop-down list. Specify the volume label, file system and the allocation unit size in the format wizard. Click "Ok". When your data gets lost, stop using your computer or laptop immediately and try to determine the cause of the data loss. Whether it is a hardware failure or a software failure, time is of an essence. Get Recoverit hard drive recovery software to recover your data as soon as you can. Avoid overwriting data into your formatted hard drive as it can make it difficult to recover all your lost data. Lastly, get into the habit of taking regular backups so even in a case where you accidentally format your hard drive / USB flash drive / Memory card, you have a backup to fall back on.